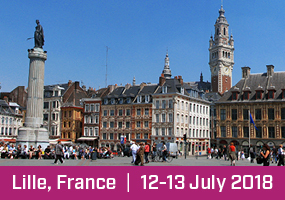 It is our privilege to invite you to the 2nd International Symposium on Advances in Pharmaceutical Analysis (APA 2018) which will take place on July 12 and 13, 2018 in the capital city of the Flandres, Lille. The scientific programme will include plenary and keynote lectures given by internationally recognised scientists, as well as oral and poster presentations. APA 2018 will cover all aspects of pharmaceutical analysis, including pharmacy and cosmetics, new technologies, instrumentations and separation media for GC, HPLC and SFC, chirality, data processing (chemometrics and quality by design), mass spectrometry hyphenation, cosmetics, pharmaceutical quality control and drug safety, green analysis and applications and all modes of chromatography and electrodriven separation techniques. An attractive programme of social events will also be arranged during the symposium and cultural visits will be organised on Saturday, July 14. All conference participants and registered accompanying persons are kindly invited to all conference related scientific and social events. Looking forward to welcoming you in Lille in July 2018!